Corrientes convectivas que marchan rebotando pegadas al fondo -pues allí guardan la memoria de sus tránsitos- son los responsables de estos enfrentamientos con las dinámicas superficiales; y son los sedimentos los que ofician de baterías convectivas como motores en esos corredores altamente disociados en la columna vertical. Observaciones que en nada coinciden con el texto que sigue de la N.A.S.A. . . . . . . 20/2/12 . F.J.A. This photograph, taken from the International Space Station (ISS), shows the north coast of Trinidad and a series of subtle, interacting arcs in the southeastern Caribbean Sea. These are known as “internal waves,” the surface manifestation of slow waves that move tens of meters beneath the sea surface. 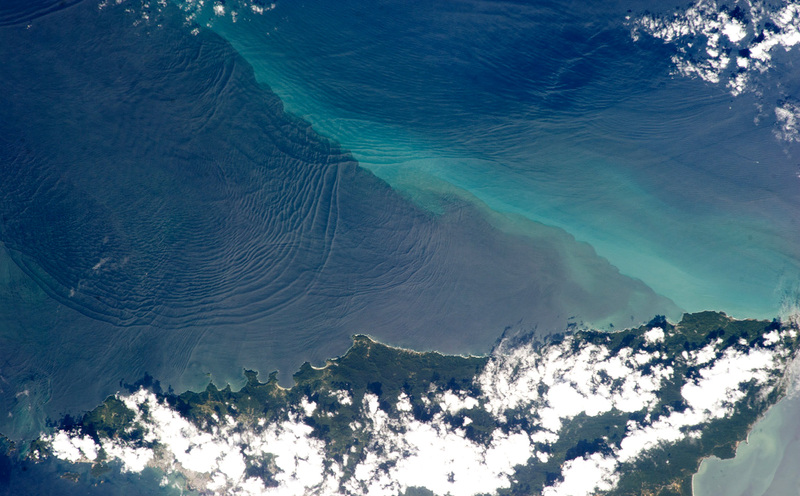 Internal waves produce enough of an effect on the sea surface to be seen from space, but only where they are enhanced due to reflection of sunlight, or sunglint, back towards the International Space Station. The image shows at least three sets of internal waves interacting. The most prominent set (image top left) shows a packet of several waves moving from the northwest due to the tidal flow towards the north coast of Trinidad. Two less prominent, younger sets can be seen further out to sea. A very broad set enters the view from the north and northeast, and interacts at image top center with the first set. All the internal waves are probably caused by the shelf break near Tobago (outside the image to top right). The shelf break is the step between shallow seas (around continents and islands) and the deep ocean. It is the line at which tides usually start to generate internal waves. Over the island of Trinidad, the heating of the land surface sets off the growth of cumulus clouds. Off the coast, a light blue northwest-southeast trending plume at image center is sediment embedded in the Equatorial Current (also known as the Guyana Current). The current is transporting material to the northwest—in almost the opposite direction of the internal waves. The current flows strongly from east to west around Trinidad, all the way from equatorial Africa, driven by year-round easterly winds. Seafarers in the vicinity of Trinidad are warned that the current—and its local reverse eddies—make navigation complicated and sometimes dangerous for smaller craft in these waters. Astronauts also have observed internal waves in other parts of the world, such as San Francisco and the Straits of Gibraltar. Astronaut photograph ISS034-E-32377 was acquired on January 18, 2013, with a Nikon D3S digital camera using a 180 millimeter lens, and is provided by the ISS Crew Earth Observations experiment and Image Science & Analysis Laboratory, Johnson Space Center. The image was taken by the Expedition 34 crew. It has been cropped and enhanced to improve contrast, and lens artifacts have been removed. The International Space Station Program supports the laboratory as part of the ISS National Lab to help astronauts take pictures of Earth that will be of the greatest value to scientists and the public, and to make those images freely available on the Internet. Additional images taken by astronauts and cosmonauts can be viewed at the NASA/JSC Gateway to Astronaut Photography of Earth. Caption by M. Justin Wilkinson, Jacobs/ESCG at NASA-JSC and Susan K. Runco, NASA-JSC.